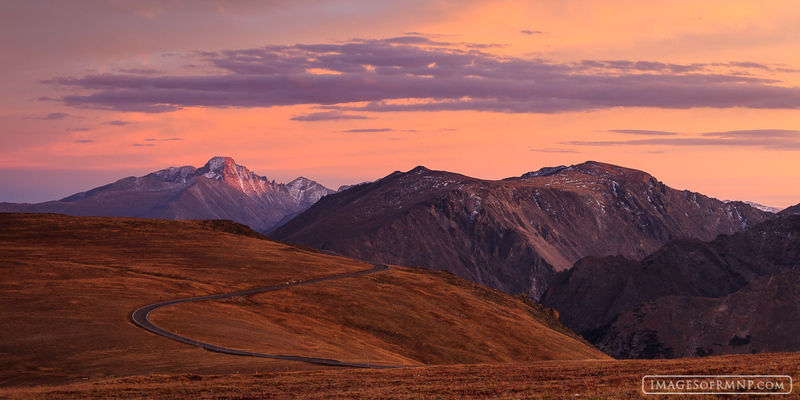 Trail Ridge Road is one of the most amazing drives in the United States taking you into a world high above treeline where the harsh weather has created a world of amazing beauty. On a warm September evening Longs Peak, the highest mountain in Rocky Mountain National Park, was lit by the setting sun as the sky and the surrounding tundra took on pastel hues. Soon, autumn would give way to winter and this stunning alpine world would again become inaccessible. Photo © copyright by Erik Stensland.